Another 24 Hour Comic Day finished… now what? I spent yet another weekend making my twelfth 24 Hour Comic Book for 24hr Comic Book Day 2017. The usual goal is to make a 24 page comic in 24 consecutive hours, but this year I decided to make a bunch of mini-comics instead. I managed to get 8 finished during the 24 hour period and I think they look fantastic. I’m not sure what I’m going to do with them though. One thought was to do a limited run of risograph prints of all 8 comics and sell them through Kickstarter. Another idea would be to sell them as an assemble-yr-own-mini-comics set, which would be good for me because cutting and folding each of these comics is going to be really time consuming. Here’s a timelapse of me drawing this year’s batch of #24hcd comics at Mission Comic’s and Art. The Bay City Beacon also wrote this story about our 24 Hour Comic Book Day challenge and Mission Comics. I also made some 24hcd bingo cards! If anyone is interested in printing those for your event, you can download them here (or here). Download “Flies On Mars”, my newest comic, for free! I just recently posted Flies on Mars (part 1) here. It’s a free download and will only be up for one week. 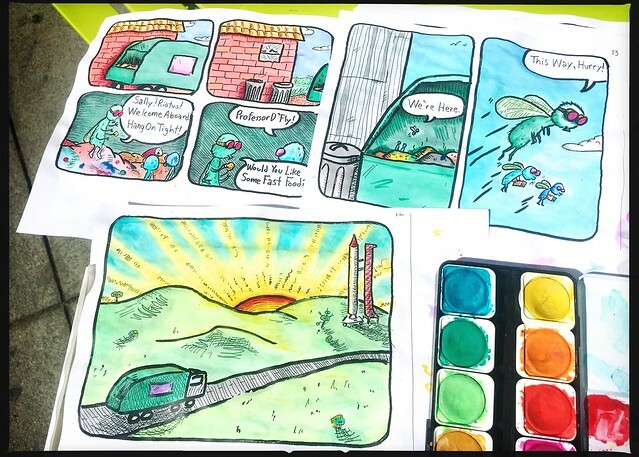 It’s a short story about the pioneering spirit of fruit flies that I created as part of this year’s 24 Hour Comic Book Day challenge. I’m sort of treating this like a pilot episode… if enough people like it and encourage me to finish it, I’ll flesh it out in a few more issues over the next year. So head on over to http://gum.co/flies and download it while it’s available. I spent last weekend at Mission Comics creating my 12th (or possibly 13th?) 24 Hour Comic Book. This year’s book is called “Flies On Mars” and is about the pioneering spirit of fruit flies. I’ll talk more about that book in another update, but I just wanted to let y’all know that I’ll be reading two of my newest comic books, “Flies on Mars” and “Far Away” at Mission Comics next Saturday as part of the Lit Crawl. If all goes well, I’ll have physical copies of Far Away for sale too. Come and watch. A reading of original comics’ works while cartoonists stand semi-awkwardly in front of a screen projection of said works.